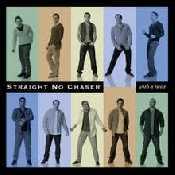 "I'm Yours / Somewhere Over The Rainbow"
With A Twist es el tercer álbum de estudio del a banda Straight No Chaser que nos presentaba 13 nuevos temas en el 2010 y que llego a estar en la posicion 29 del Billboard char en USA. 1. "I'm Yours/Somewhere Over the Rainbow"
3. "Don't Dream It's Over"
5. "You're My Best Friend" 6. "The Living Years "
7. "You & Me & the Bottle Makes Three/Single Ladies"
9. "Joy to the World"
10. "Under the Bridge" 11. "Can't Take My Eyes Off of You"
12. "One Voice" feat. Barry Manilow 13. "Only You"